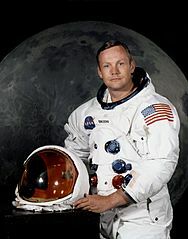 American who went to space. His moon walk enthralled human race. His name will always be taken in same breath as george mallory, Roald Amundsen and other legends.A man who did the impossible task.